The 2019 Annual Amendment to the Comprehensive Plan and Land Use Regulatory Code ("2019 Amendment") is a process through which the City considers changes, additions, and updates to the One Tacoma Plan and the Land Use Code. Periodic review and evaluation are important in order to ensure that the One Tacoma Plan and the implementing regulations maintain their effectiveness. The 2019 Amendment is comprised of six public-initiated applications, as described below (further down on this page). Subjects: (1) Shoreline Master Program Periodic Review, (2) Affordable Housing Action Strategy Incorporation into Comprehensive Plan, (3) Historic Preservation Code Amendments, (4) Manitou Potential Annexation, and (5) Minor Plan and Code Amendments. Special Note: The 1st session concerning Shoreline Master Program Periodic Review is a Joint Public Hearing of the City of Tacoma and Department of Ecology. Planning staff conducted five open houses in February and March 2019 on the 2019 Amendment to raise awareness and inform interested community members regarding the purpose and potential impact of the changes, to gather community feedback on the issues, and to identify areas of community concern. We appreciate your participation! The Future Land Use Map of the Comprehensive Plan provides a basis for applying zoning and for making land use decisions. This project will put into effect the land use designations through appropriate area-wide rezones to achieve consistency with the Future Land Use Map, and work to achieve the goals of the One Tacoma Plan. The State Shoreline Management Act requires local governments to periodically review their shoreline master programs and make any adjustments deemed necessary to reflect changing local circumstances, new information or improved data. Per RCW 90.58.080, the City of Tacoma is required to conduct a periodic review on or before June 30, 2019. The initial public scoping phase of the project will inform what information, issues, and topics are pertinent for this periodic review. This project will update the Housing Element to reflect the up-to-date policy recommendations of the Affordable Housing Action Strategy (AHAS). 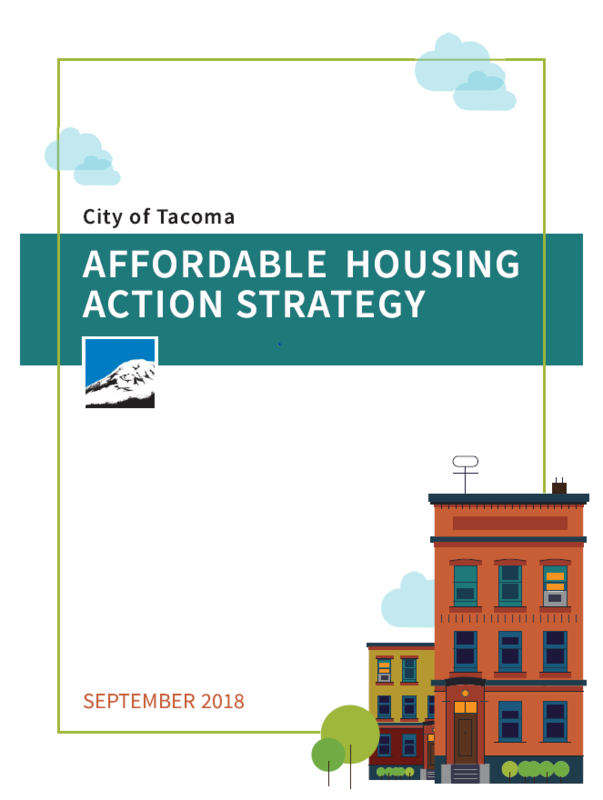 The AHAS is a strategic response to a changing housing market, increasing displacement pressure, and a widespread need for high-quality, affordable housing opportunities for all. The AHAS focuses on how to enhance existing policies and programs to serve more people; identify and deploy additional funding; and establish strong anti-displacement measures to stabilize existing residents over the next 10 years. The Housing Element is one of the City's principal statements on housing. Since it was last updated in 2015, community concerns regarding housing issues have increased significantly. This project will seek to improve the effectiveness of the Historic Preservation Program through a series of code amendments, including: enhancement of demolition/cultural resources impact review within TMC 13.12.570; clarification of the nomination and designation process and review; and improvements to the Historic Conditional Use Permit. This project involves the pre-annexation planning for the Manitou Potential Annexation Area located at the southwest corner of the City. Expected outcomes of the project, upon the area's annexation to the City, include changes to the Comprehensive Plan maps and policies as appropriate. As part of the 2019 Amendment, this proposal would amend the Land Use Regulatory Code to keep information current, address inconsistencies, correct errors and clarify code language, in order to improve code administration efficiency and enhance customer service. UPDATE: Proposed adoption of this update will be deferred until 2020. Further updates will be provided regarding public engagement opportunities. The Commercial Zoning Update will revise the design and development standards for the City’s Neighborhood and General Commercial Zoning Districts. The project will bring these districts into alignment with the goals and policies of the One Tacoma Plan to promote a more context-sensitive commercial zoning standards as development occurs.